MKM Soap makes some of the best handcrafted soap in the country. We are a small business located in the beautiful hills of Haldeman Kentucky, just outside of Morehead Kentucky, and run by a U.S. Military Veteran husband and wife team. 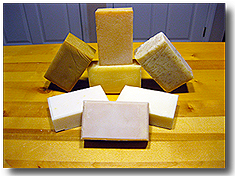 Our mission is to provide quality handcrafted soap and soap products at fair prices. We work hard to create handcrafted soap that not only works fantastic but is not harsh or drying to your skin as most store bought soaps are. If you try it, we know you will love it! Our handcrafted Soap is made from 100% natural ingredients like Olive Oil, Canola Oil, Coconut Oil, Sunflower Oil, Castor Oil, Sodium Hydroxide, Water and fragrance. We do our best to ensure everything we use to make our handcrafted soap is Made in the U.S.A., down to the plastic scoops that come with our handcrafted laundry soap. We support our local business as much as humanly possible by buying locally sold products to create our handcrafted soap products. We are tired of seeing "Made In China" on virtually everything we buy and we’re pretty sure you are as well. This is why we state MKM Soap is "Not Made In China" on all of our handcrafted soap products. You can feel good about buying and using our Soap products, knowing that you are supporting Main Street America! handcrafted Soap Handcrafted In The Hills Of Kentucky! Our soap is handcrafted with love and care. We take pride in our process and strive for quality in each and every batch. Our soap is lye based but be assured it ain’t your grandma’s lye soap! Our recipes are designed to provide excellent lather, cleaning ability and moisturizing effects. They contain multiple vegetable oils, each one selected for its unique qualities. Some oils create lots of lather but are unstable, others don’t make much lather but are very stable, while still others soften skin and help moisturize. 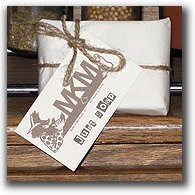 MKM soap is made for regular folks who want soaps that work well without drying the skin. We Do Not Make Boutique Bars! Something You Should Know: Commercial soap makers use chemicals to create soap from crude oil byproducts. Then they extract all the glycerin that is produced in the soap making process. Glycerin is a natural moisturizer and is removed in order to make other products like moisturizing lotions, creams and cosmetics. Soap makers know their soap dries out your skin, they want it too so you’ll also buy moisturizers! MKM handcrafted Soap keeps all of its natural glycerin goodness. If you try it, we know you’ll Love It! Click here to view the MKM Soap, LLC Business To Light Listing!